Because I'm an expendable, minimum-wage employee when I'm not at home working for myself, I get a generous share of evening shifts. I know it's not too terribly late, but when I get home at 10pm I need time to relax and decompose... no wait, decompress(See, my brain doesn't work after 10pm) and so I stay up later than usual and get tired. Working at Forever 21 last year was much worse: even though we closed at 9pm, we never got out of the building until 10:30, not to mention the half hour drive home. I was very crabby in the five months that I worked there. 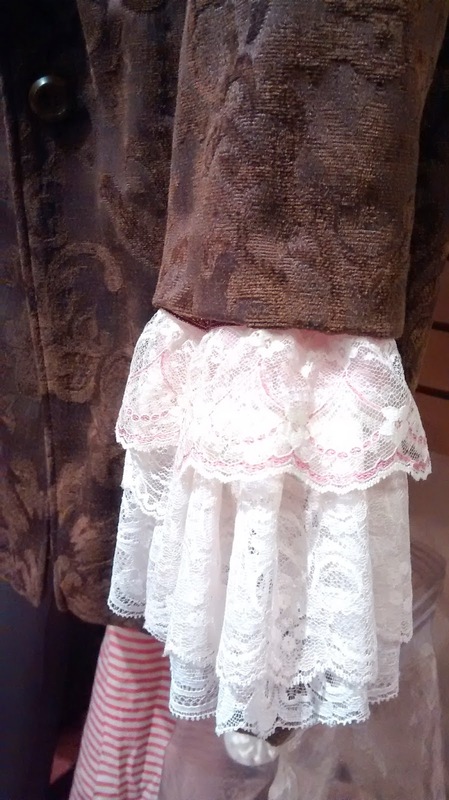 Projects at Pigtails: The Wardrobe costume for Beauty and the Beast. So the other day I was called in to work an hour early because a coworker had just not shown up for her shift. She had been unreliable in the past and was known to not be a good worker; she also had lots of health problems, so she asked off a lot. The Practical Manager called her to say since she had missed a shift she was on probation. Several hours later Nice Manager answered the phone to find out the employee had died suddenly. So I got her Saturday shift. I didn't know her well, but I felt sorry for the Nice Manager- she was pretty tearful for the rest of the evening. I think the moral of the story is don't smoke and work hard, and always always be appreciative if you have a Nice Manager, because she's the only coworker who's going to cry for you when you're gone. Very effeminate Pirate cuffs on an old ladies' coat. A good way to use up lace. I've been working on my latest wholecloth quilt. I laid it out in February almost a year ago, and just really started working on it this Fall after I finished the Fan Quilt. This new quilt is for a queen-sized bed(someday, whether I marry or not, I'm going to have a queen sized bed), and it's the largest quilt I've done so far. It has organic cotton batting; the top is pistachio linen/cotton from fabrics-store.com and the backing is a plain white cotton sheet from Walmart(hey, I'm on a budget!). After trying cotton batting, though, I'm never going back to polyester. Wool, or bamboo, or cotton again, but never polyester. I know it's probably most common to trace out the entire pattern of the quilt top, with some sort of stencil, in the beginning before the layers are put together- but as usual learning on my own means I do things my own way, and with all my quilts I've pinned the layers together and then started with a central pattern, and worked my way out from there. I start with a general theme or picture that's based on patterns of the 18th Century or earlier and add to it as I go along. I just don't have a big enough brain to think of the whole quilt pattern all at once. Speaking of 18th Century Quilts, if I'm ever rich(not likely to happen) I would buy this super over-priced book: Four Centuries of Quilts by Linda Baumgarten. Introducing Green Stars and Ham. Green Star Rising. Green Star Wars? The name of this quilt is still open for debate. I usually don't settle on a name until the quilt is done; but I'm open to suggestions. 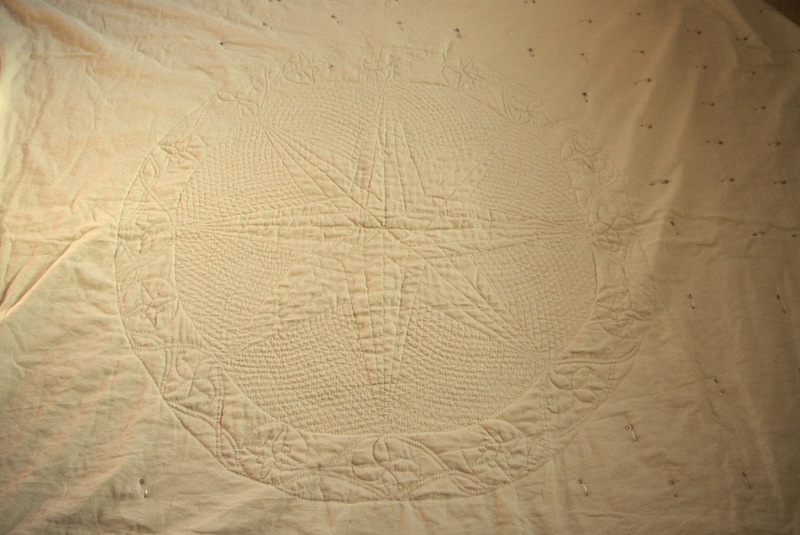 It's a central medallion quilt with the medallion being a large eight pointed star. You can't really tell in the pictures, but the fabric really is green. The border around the star is made of two different star patterns with a sort of simple Celtic knot woven around them. Around that I'm going to put a verse from Henry Van Dyke's well known hymn, Joyful Joyful we Adore Thee. The hymn wasn't written until 1907, but the tune was completed by Beethoven in 1824, so I figure I'll be halfway correct when I work on this at the Fort. It's a grand song, and it talks about stars, so it fits. Finally finished this custom order of black wool breeches. The wool is broadcloth from Wm. 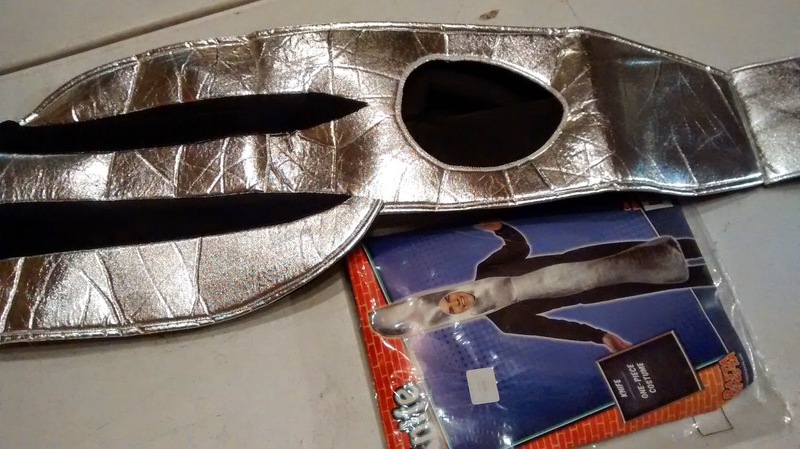 Booth, and it's great fabric, but I don't think I'll advertise this type of breeches on Etsy. It's a very springy fabric so it makes doing any detailed work difficult, it shrinks like crazy so it's not really washable, and it's black, so of course my hair and every kind of lint sticks out like a Presbyterian in a Pentecostal church service. My hair! How can I still have so much on my head when it falls out all the time. I have to make sure I lint-roll all my orders before I ship them. So with that said I think I'll stick with advertising the linen/cotton breeches. The fabric is affordable, wears well, and is great for warmer weather, which it seems is when the majority of large reenactments take place anyway. If someone really does need warm breeches, I would recommend modern wool suiting(NOT in black), which is cheaper and more washable, and then I would suggest lining them with flannel. You have to line wool breeches anyway, since wool can be itchy. The knee placket: the part where I had trouble. I also ordered heavy Osnabug linen from Burnley and Trowbridge for a custom order that fell through(it was for a fringed hunting frock). I think that the Osnaburg is not much different from the heavy-weight linen on fabrics-store.com, although it's $4 more per yard. So if any more hunting frocks are in my future, I'm definitely advising fabrics-store.com linen. Material cost is so high for reenacting outfits, that it makes custom orders very difficult to price. So it's 2015! I have a goal this year to improve my work situation. The manager who never approves of me still doesn't approve of me, and the manager who is bad at business is still bad at business, and more and more I'm just tired of working three jobs. Work does provide fodder for blogging in my otherwise uneventful life: there's always the time a coworker said I reminded her of a nun on a reality TV show(seriously? ), and my manager who said I was sheltered because I didn't know what psychedelic meant. I think she was joking? Turning a foam knife into a spoon and a fork for a High school version of "Beauty and the Beast." This is the kind of job that occupies my time at Pigtails. Velvet was 70% off at John Adams this week, and when you add on my 25% off employee discount on top of that, it was a price I couldn't refuse. 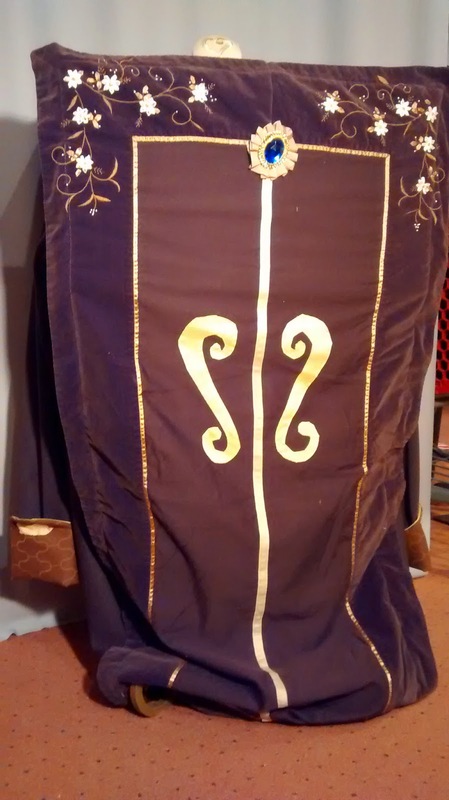 I have a black stretch velvet skirt already, but it's bulky around the waist, and since it washes in the machine fine and looks classy, I thought making a better fitting black velvet skirt might not be so hard. It's like knit, but with fuzz, right? So I'm blithely entering into this new realm of sewing with velvet because at $3.37 a yard, whatever happens, it won't be the end of the world. So I'll let you know how that goes! It was so nice to be on vacation and just not have to go in to work for a few days. I did have to work closing on New Year's Eve, though. We were really busy all evening, but still closed early- and even as we were cleaning up people came knocking on the door, upset that we had closed early. Really, you have to buy fabric on New Year's Eve? A few projects I got done over the holidays: I finally finished this vintage blue wool vest with mismatching silver buttons. It's been in the pile for months. And the Christmas present of a bright yellow skinny tie- Andrew specifically asked for it. 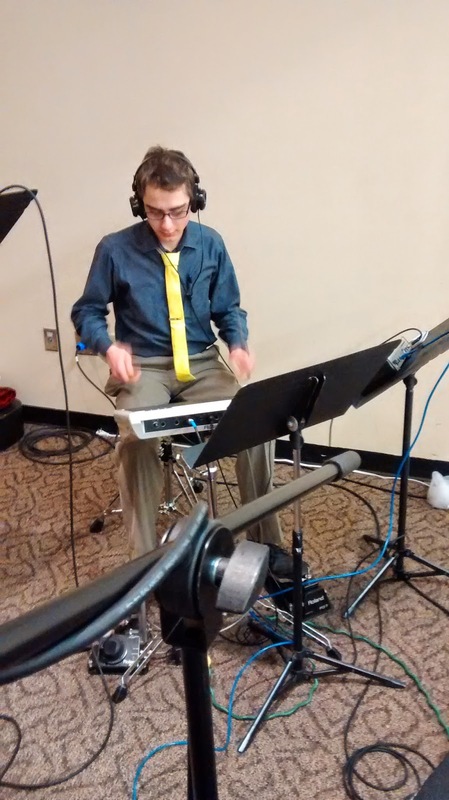 The man with a yellow tie. 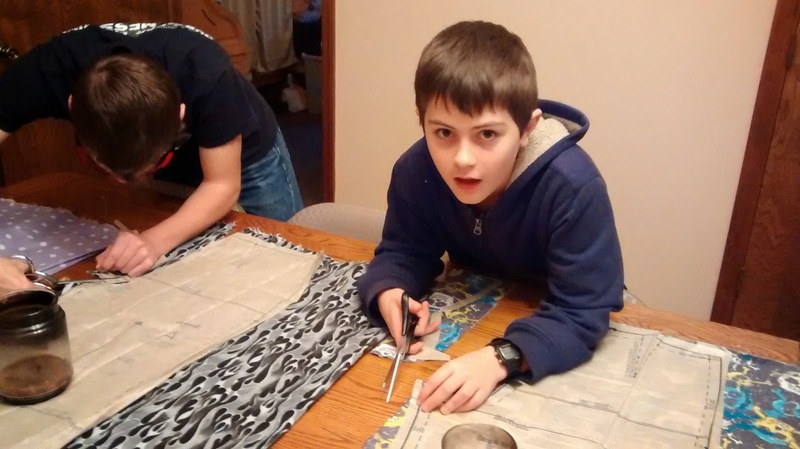 Teaching the boys basic sewing. They picked out flannel(it was one sale) for pajama pants. 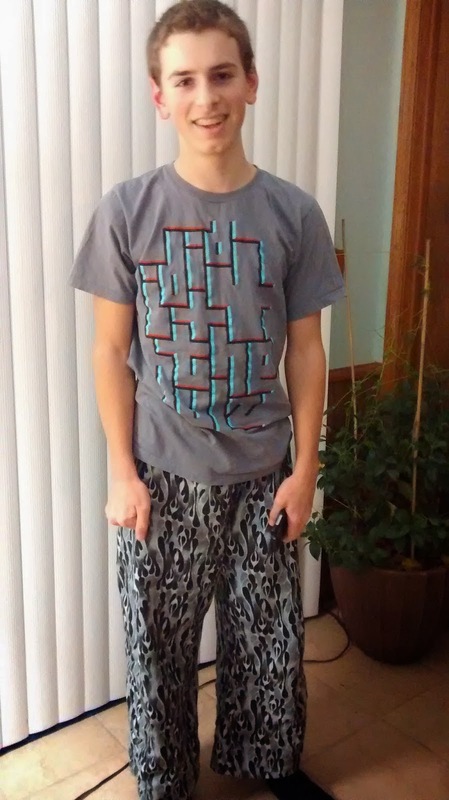 Pajama pants he made himself. Don't tell him I posted this online. Working with the public can be interesting. Last week at work I cut fabric for an older man, at least in his fifties. Just as a general way to start friendly conversation, we usually ask what the customer is planning to make. This guy said he was making lingerie for his wife, and then I was sorry I had asked and tried to end the conversation. Then when I came back to work on Saturday there was a surprise in the break room: the guy had written me a page-long description complete with an illustration of the lingerie he was making, supposedly for his wife, and mailed it to the store. I seriously, seriously did not need to know, and I hope he never comes back!